Free advance online reservations are the best way to see the Reichstag parliament building and cupola in Berlin. Prior reservations and official identification are essential for all visitors. The cupola on the Reichstag building in Berlin is the second most popular sight in Germany. 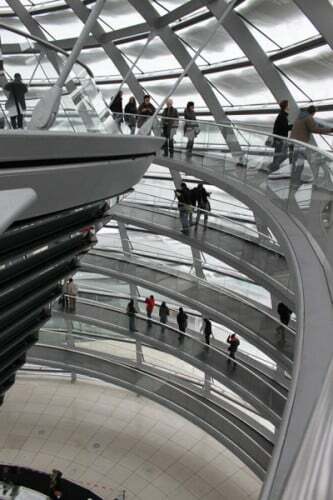 Queuing for tickets is no longer necessary, or indeed possible, for free admission to the spiral walkway in the dome at the top if the German parliament. Advance online reservations for the Reichstag are free and the best way to get tickets. Alternatively, tickets can be requested outside the parliament building but the number of available tickets is very limited. 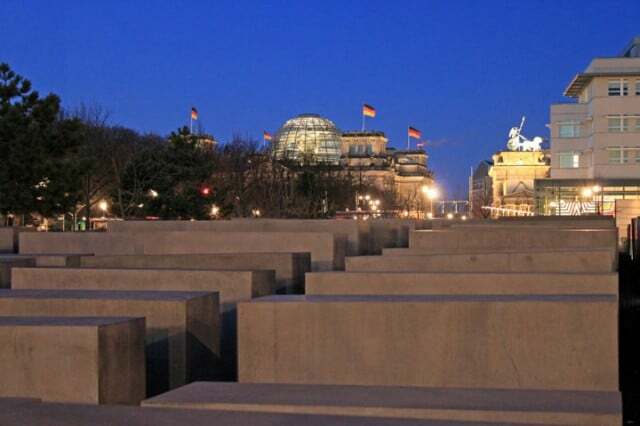 Some Berlin sightseeing tours also include a visit to the roof of the Reichstag and may get access to the Reichstag dome on dates that are no longer available through the direct official channel. The Reichstag building in Berlin is considered the second most popular site in Germany (only the Cologne cathedral may claim more visitors). The Reichstag building is not particularly old – it was constructed at the end of the nineteenth century but hugely remodeled a century later with the popular Kuppel walkway designed by Sir Norman Foster added. The views from the roof and the dome are the main attractions of visiting the Reichstag. The building originally housed the Reichstag, or lower house of the German parliament. Reichstag means imperial diet – Reich = empire, Tag = meeting. The name stuck – with the German Reich long gone, it now houses the Bundestag or Federal Parliament of Germany. For about a decade after the opening of the cupola on the Reichstag building, queuing outside the building to enter for free was the norm. Clever visitors judged the line from bus 100 – if it was more than halfway down the staircase, it was more sensible to stay on the bus and try later. However, currently advance reservations are not only possible but also needed. The process is not surprisingly bureaucratic but surprisingly not fully automated. In addition, for a nation fairly obsessed with internet security and data protection, the German Bundestag requires quite a bit of personal information even before confirming whether tickets are available. At the Bundestag website go to Visit the Bundestag (first find the English button if necessary), then online registration to select the type of visit – visit to the dome is the more common but free guided tours of the building or attending a plenary session followed by a visit to the roof cupola are also available. The website of the Bundestag is not particularly user friendly and for example currently require visitors to scroll down manually after each enter to find more details. Available dates are listed for the same day and for up to a year in advance – up to three dates or times may be specified. Then enter details, wait for an email reply, click the link in the email and provide personal details of people in the group. Then wait for another email confirming that your request has been forwarded to the relevant authorities – this email is not the actual confirmation email that place is available. The final email with pdf document confirms the date and time but reverts to personal data paranoia by not actually listing any of the names of the members of the group but be sure that names and birthdates correspond when turning up at the Reichstag. The ticket is not transferable and may be cancelled at short notice if the Dome is closed for whatever official reason. the whole process may take a few hours or even days. The cupola and roof of the Reichstag is open daily from 8 am to 23:00 (last admissions at 22:00). 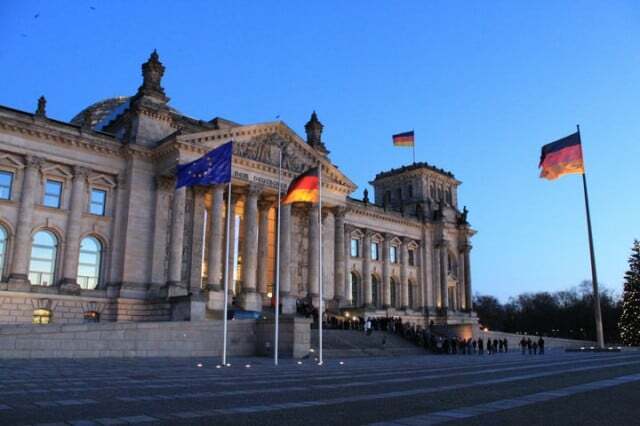 Visitors enter in groups every 15 minutes – turn up 15 minutes earlier than the stated time at the rather scruffy temporary looking security check buildings at the far end of the lawn from the Reichtag’s stairs. The Reichstag dome is closed on December 24, close late afternoon on December 31, and may be closed on a few other days, mostly for maintenance (usually a few days in March, July and October). Once inside, visitors can stay as long as they please. A free audio guide (available in 10 languages) gives a tour of the history and sights that can be seen on the walk up to the top of the dome. Proof of identity is required at the Bundestag and expect airport style security, although generally a lot friendlier. Online reservations are the preferred method of visiting the cupola of the Reichstag and the only method that will ensure admission. Telephone reservations are not taken but email and snail mail are other options. Visitors without advance reservation can enquire from the Visitors Service kiosk in Scheidemannstraße next to the Berlin Pavilion if tickets are available. Admission times will be at least two hours later. It is also possible to register for a visit within the following two days if space is available. Preference is given to online reservations meaning there may not actually be any tickets available on some days. 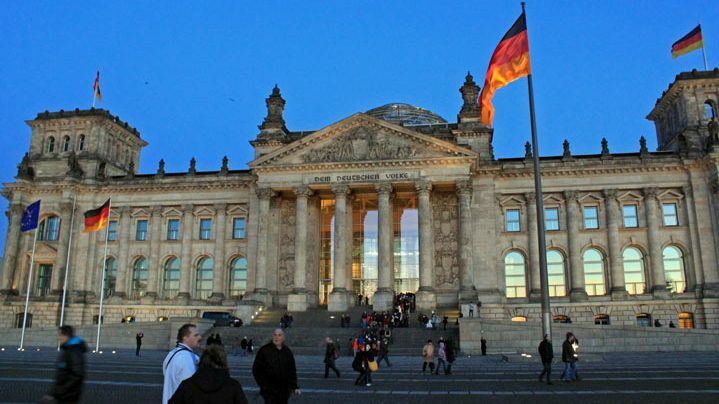 A popular combination is to combine a tour of the cupola with a visit to the exclusive Käfer restaurant on the Reichstag roof – coffee and cake is cheaper than lunch or dinner. The visit to the Reichstag roof and cupola is usually at the end of these tours, as everything is free, and handled by the Bundestag, once the Reichstag building is entered. Visitors may stay as long as they please once inside. Getting to the Reichstag is easiest using public transportation. Bus 100 stop right in front of the side of the building in Scheidemannstraße at bus stop Reichstag / Bundestag. From the Hauptbahnhof, it is also possible to use U-Bahn U55 to the Bundestag – one stop. S & U Bahn station Brandenburger Tor is also close just a short walk from the Bundestag building. Rick Steves Berlin Guide is a great choice for a first or short visit to Berlin. He does a good job of narrowing the huge city and wealth of attractions down to those generally of most interest to foreign travelers. The guide is easy to read, well organized, full of time and money saving tips with useful walking routes and self-guided tours to some of the top museums and best attractions.